Katherine Ferns is in Stitches is a raunchy, raw, and rare blend of brutal trauma and gut-busting comedy. Fusing drama and stand-up in a beautifully twisted concoction, it is currently playing at Factory Theatre as part of the Toronto Fringe Festival. Notable about this show is the subject matter: delving into a past of domestic abuse, Ferns pulls out the stops to deliver a raw, unhindered retelling (synonym) of her–*ahem*–“romantic” past. What’s admirable is that no matter the intensity of the details, they remain digestible. Ferns has an uncanny ability to relieve every traumatic dip with a comedic high. Any moment that could be awkward or uncomfortable is eschewed by her swift, persistent delivery. Katherine Ferns is an excellent storyteller. Throughout her 60 minute show she seamlessly glides between deeply personal, raw experiences, and raunchy, clever humour. Utterly engaging, she doesn’t miss a beat no matter how dark the detail — or punchline. As much as this is a one-woman drama, it is also a stand-up routine, complete with Trump jokes, self-deprecating humour, and a very casual atmosphere. I believe this tone is essential to the impact of the story: Ferns gives way to the heavier, darker branches of her narrative by warming up with lighter jokes, gradually introducing us to her world and her comedic style. 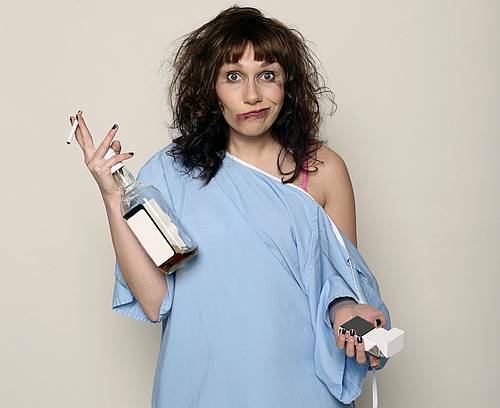 Honest, hilarious, and brutally personal, Katherine Ferns is in Stitches is a fantastic one-woman show. It is playing at Factory Theatre until July 14th.